Jypyä Pop (Turku, Finland) on 3 September 2018 in Cityscape & Urban and Portfolio. A couple of nights ago there was a large blackout during which all the lights went out. It seemed quite strange to look out the window when there was no light anywhere. Just as it would have returned to childhood in rural areas. Yes we do not know real darkness anymore ! it looks like privet drive! The lights give a nice atmosphere. When we have blackouts, even street lights do not work so it is even darker! @Ruthiebear: This picture is not a blackout but before that. When the electricity broke down, it was dark everywhere. This is a much better situation. A mysterious ambiance captured here with the misty atmosphere under the light!! This has a look of mystery to it. In a city we are almost never in darkness. 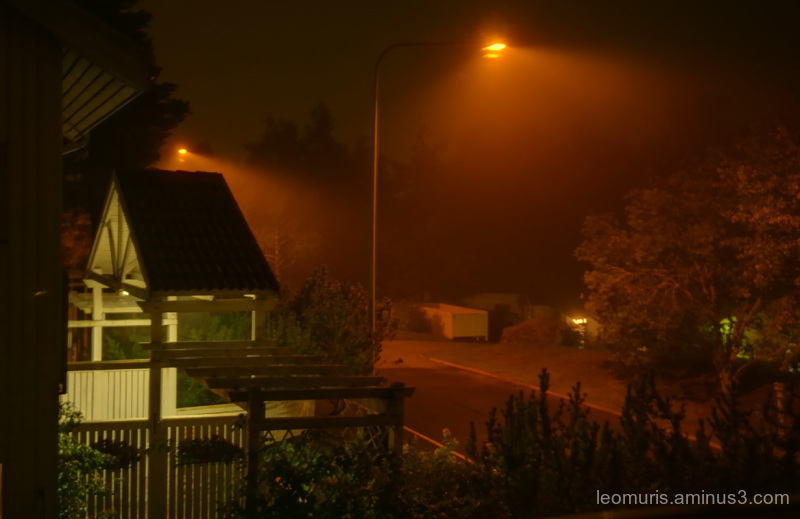 @B. Thomas: We live on the outskirts of the city, where lights are generally less than in the city center. Power failure was the first of this. Then it was completely dark. There was no light anywhere around an hour. Fortunately, power outages are not too frequent around here anymore. Years ago, we had one, after a storm, that lasted for a week. The only place of complete darkness I've found is in the desert. @Steve Rice: Fortunately, they are also quite rare here. In general, darkness is not in cities because there is a lot of light. Actually, it should sometimes be a dark moment that we could clearly see the dull and the stars. Nothing more frustrating than sitting in the dark. No TV, no internet, perhaps a flashligt to read by. But you had an outside light and a camera. @Harry: This image is not a blackout. During that time it was all dark, just as you describe it. @Hiro: It is very true.